Here is a great chance to see the work that Resource Group AV does! 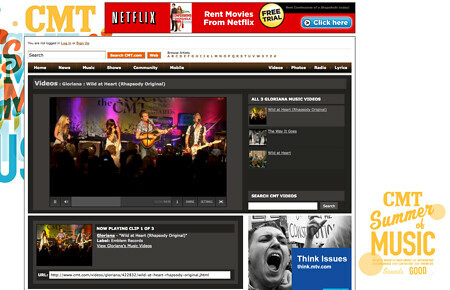 Go to the CMT link here to see the live HD recording of Gloriana at CMT for Rhapsody Rocks. Filmed with 4 x Panasonic P2 cameras, Panasonic HD switcher and recorded to 32track ProTools. This entry was posted on August 3, 2009 by resourcegroupav. It was filed under Uncategorized, Video and was tagged with cameras, CMT, country music, Gloriana, Nashville, pana, panasonic, Real Network, Resource Group, Rhapsody, TNDV.